We had a feeling, when ABC and FOX had Washington State and Purdue host primetime games against top 12 opponents, that something crazy would go down. Both Oregon and Ohio St got dominated in rare fashion, as we saw a fantastic night of football. The morning and afternoon slates were pretty good as well. There are only 5 undefeated teams left. 8 weeks are in the books, and – out of 130 FBS teams – there are only 5 undefeated teams remaining. Alabama is on a bye. UCF is on a bye. 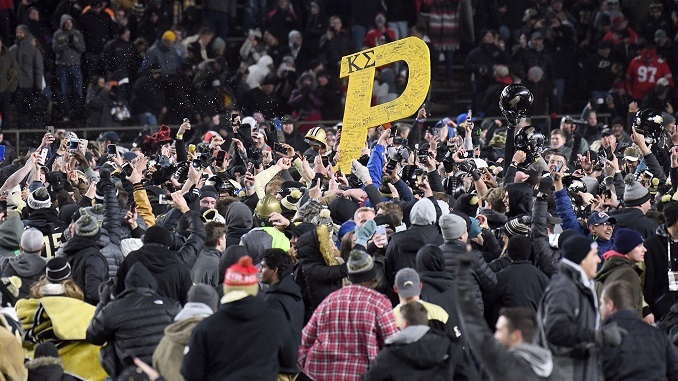 Purdue beat up on Ohio St, and it wasn’t fluky at all. Purdue felt pretty good about their chances vs Ohio St, and as the game went on, the nation realized that Ohio St was not ready for primetime. Now, don’t get me wrong… the stat lines ended up looking really good for Ohio St. They actually outgained Purdue in total yardage 546 to 539… but don’t let it fool you. Purdue outgained Ohio St 7.49 yds per play to 5.56. Everything about this game felt good for the national audience, from the underdog beating up on a team that most of the nation doesn’t like, to the #TylerStrong storyline of the kid battling cancer that the entire Boilermaker team has rallied around, it was almost storybook-ish. The most interesting thing here is what might have been if Brohm had been starting David Blough at the beginning of the season, and they had found a way to beat Northwestern in Game 1. If they had beaten NW, Purdue would be sitting at 4-0 in the Big 10. As it stands, they’re currently 3-1 in conference, with games at Michigan St, vs Iowa, at Minnesota, vs Wisconsin, and vs Indiana left for a chance to go to the Big 10 Championship game. The Big 10 West race has gotten insanely more interesting thanks to this outcome. And Ohio St / Michigan at the end of the year looks much juicier now. Michigan obliterated Michigan St worse than the scoreboard says. Michigan 21 / Michigan St 7. Of course, that doesn’t tell the whole story. Michigan ran for 183 yds on the nation’s #1 rushing defense. Michigan’s offense outgained Michigan St 395 yds to 94. Yes, Michigan St had less than 100 yds of total offense. The funny thing is that this game was setup to be the kind that Michigan St always wins. You know… where it doesn’t make any sense. There was the lightning delay, and the rain, and the cloudy skies, and the fact that the game was tied 7-7 deep in the 3rd quarter. But Michigan held the football for over 40 minutes, and didn’t give Michigan St any room to even breathe, as they utterly dominated the Spartans in East Lansing. Now Michigan gets a bye week to catch their breath before hosting Penn St, who gets the warm-up against a great Iowa defense this week. LSU stomps Miss St, and will be in top 4 when Alabama comes to the Bayou. I’m going to give credit to LSU for taking advantage of nearly every big opportunity they’ve been given all season. But first, let me discuss Mississippi State. Can anyone explain to me why Joe Moorhead continues to let Nick Fitzgerald throw the football? In Saturday night’s game, Fitzgerald was 8/24 for 59 yds and 4 interceptions. But it’s not like this is the first time he’s done this. Against Power 5 competition, Fitzgerald is 55/126 (43.6%) with 4 TDs and 7 interceptions. In their biggest win of the season – 23-9 against Auburn – they threw the ball only 17 times. Against LSU, they averaged 5.43 yds per carry, but ran it only 37 times for 201 yds. Against Auburn, they ran the ball 57 times for 349 yds. Obviously, the passing game hasn’t been working, so why continue to force it? Just ridiculous. Now, for LSU. After thoroughly dominating Georgia last week, the Bayou Bengals continued their streak of not converting Touchdowns, and allowed Cole Tracy to continue his run towards most field goals made in a season, as he currently sits at 21/23 FGs after hitting 5 of 5 vs Georgia last week, and 4 of 4 vs Mississippi State this week. Obviously, it’s great to have a reliable field goal kicker, but the only touchdown LSU scored all night was when Fitzgerald threw an interception on the opening drive that was returned to the Miss St 3 yard line. Even then, it took LSU 3 plays to score a TD. LSU’s offense did just enough, as they were outgained 260 yds to 239. They had drives stall at the Miss St 7, 20, 11, and 22 yard lines. LSU has now been outgained in 4 games this year (vs Miami, Louisiana Tech, Florida, and Miss St), and still found a way to win 3 of them. Their 5.33 yds per play is good for 98th in the country, but they currently have the 5th best turnover margin in the country (+12), and lead the country with 14 interceptions. So, with this win, they currently sit at #4 in the AP poll, and don’t appear in any danger of being jumped by Michigan (on a bye), or Texas (@ Oklahoma St). The only team that might jump them is if Florida dominates Georgia the same way LSU did, and, at that point, it would be hard to argue having LSU ranked ahead of Florida, since the Gators beat them in Gainesville 3 weeks ago. Regardless, Alabama vs LSU will be a Top 5 matchup in Baton Rouge on November 3rd. Clemson 41 NC State 7. Tigers look set to run the table. Most people assumed Clemson would win this game because their rushing attack was so much stronger than NC State’s, as the Tigers had been averaging over 280 ypg on the ground. Instead, this was Trevor Lawrence’s coming out party, as he threw for 380 yds on the day, and the Clemson ground game only contributed 91 yds (2.8 yds per carry). The Tigers defense obliterated NC State, and force Ryan Finley into a lot of uncomfortable situations, grabbing 2 interceptions, and holding the Wolf Pack to only 193 yds passing, almost 150 below their season average. Clemson now travels to Florida St this week to face a rapidly improving Seminoles team, but, at this point, the Tigers should cakewalk through the ACC, as the Coastal division is up for grabs between Virginia, Virginia Tech, and maybe Miami? Whoever it is, I’m sure we can agree they’ll probably get slaughtered in December. Washington St took advantage of Gameday being in town and owned Oregon. College Gameday in Pullman, WA was as incredible as you might have assumed it to be. It was an all out party right in the middle of campus. And then Washington St helped everything by jumping out to a 27-0 halftime lead, before completely falling asleep in the 3rd quarter and allowing Oregon to pull within 27-20 early in the 4th quarter before scoring the game-sealing TD late. For the game, Oregon ran for only 58 yds (2.4 yds per run). Washington State’s defense is for real this year, and Gardner Minshew, who completed 39 of 51 passes for 323 yds and 4 TDs, is a perfect fit for Mike Leach’s offense. So now… Washington State remains the lone one-loss team in the Pac 12, and they currently sit at #14 in the AP Poll and #15 in the Coaches Poll, with games remaining at Stanford, vs Cal, at Colorado, vs Arizona, and hosting Washington in the Apple Cup to end the regular season. Temple 24 Cinci 17 OT was probably the best game of the day, honestly. This was a hard-hitting, back and forth game between 2 good football teams. Temple went up 10-0 in the first 6 minutes of the game, and Cinci held them scoreless until they tied the game at 17 with only [0:49] left to send it to overtime. The team this actually hurts most is UCF, who needed Cinci and South Florida to remain undefeated until they played in order to give them more high-profile victories in their chase for making the playoff. Auburn saved Gus Malzahn’s job, and their offense took a step forward against a hapless Ole Miss team, 31-16. Iowa completely shut down Maryland, 23-0, holding the Terrapins to only 115 yds of total offense, while keeping the football for almost 41 minutes of gametime. Utah 41 USC 28. Utah has been absolutely rolling teams the last 3 weeks, and their offense (and defense, really) has been an absolute machine. USC has only averaged 2.69 yds per run vs P5 competition this year. UAB 29 North Texas 21. UAB, after getting steamrolled 47-21 by Coastal Carolina, has jumped out to a 6-1 record, and 4-0 in C-USA, with an overall point differential of 234 to 106. Nebraska got their first win of the season by beating a Minnesota team that just doesn’t look the same after their starting running back and star safety went out a few weeks ago. Oklahoma 52 TCU 27. TCU gave a good fight in the first half, only trailing 28-24 at halftime. Then their offense went down the tubes again, as they were outscored 24-3 in the 2nd half. Alabama 58, Tennessee 21. Alabama scored the most points that either team has ever scored in the 102 year history of this rivalry, and this was the most points Tennessee had ever given up in the history of Neyland Stadium. Alabama gets a bye week to rest up before traveling to face #4 LSU in Baton Rouge. On the season, Tua still has not had to take a snap in the 4th quarter, and he has 25 TD passes with 0 interceptions.